beholds immense secrets of life. with no wires it interconnect hearts. Sundarapandian is a love and friendship based rural entertainment capturing the anger and frustration in love, alongside humor and sentiments leading the families to theater. Sasikumar plays the lead character and himself produced the film was directed by his late associate Prabhakaran and the movie is a kind of his usual embark on friendship cruise. Lakshmi Menon as heroine is a lovely homely debut to Tamil cinema and her innocent smile and mischievous sights are sure to strike your hearts and she also expressed a good acting. The Parotta comedy fame Soori creates wonderful humor and Appukutty’s love interest on heroine was just freak and funny but he gains overall sympathy by run over by a bus and brings a brake to the fun journey. The movie was shot almost around the Usilampatti town of Madurai district, and when it comes to movies based on Madurai it’s rare to look out of violent and anger; but Sundarapandian was much better than the previous movies except climax at bloodshed. The songs and music weren't imposing but the hero introduction song was pretty and peppy and other songs were a part of fair series. Sundarapandian is a family entertainment flick with dose of friendship notes. I’m sure Sasikumar receives many female fans follow the film and so was his acting supposed to be. 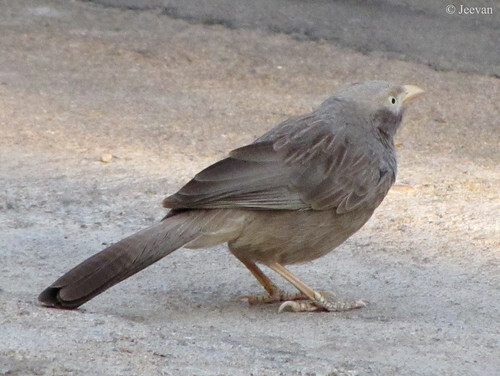 Among the many birds that visit our courtyard or neighborhood, Yellow Billed Babbler is most frequent and almost every day I sight these birds or hear their loud shrills. They arrive as a group of six or seven, kept squeaking and foraging by tiny flights. 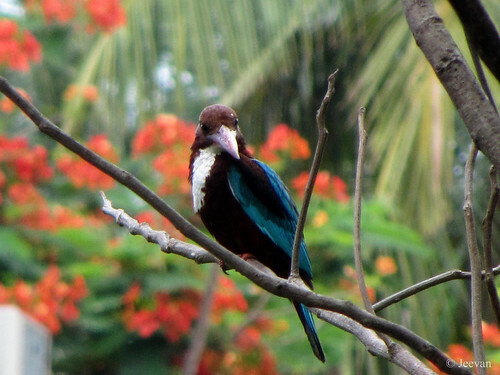 The birds present can be noticed by their distinct noise produced by their overall chattering and chirping sound; go on the ground or on low branches for forage while one of them perches to high branches as sentinel. 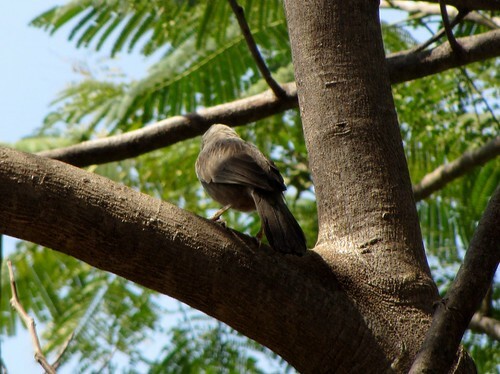 The common resident of the south Indian peninsula and Sri Lanka, Yellow-billed Babbl looks almost gray in color with light gray shades on head and belly. The birds also called as White-headed Babbler is fed on tiny insects and grains and locally we call this bird as ‘Thavuttu Kuruvi’ in Tamil, which means Barn Sparrows. where unruly might end at accident. to retreat once ashes dissolved. but we all are similar at somewhere. but the heart beats are same. Day by day technology only making easier the communication and computing and devices were becoming least in weight from kg’s to gm’s... and the operations has become simply and fast and adequate for anyone to understand and use. Before I began to use computer 12 years ago I had plenty of dreams on the device and the days waiting for it to get assembled at home were indescribable and feel of something great wanted. In more than 10 years of using computer and internet, the last two year were only been different in operating the system and content with speed. Not so greatly distinguished, the communication and sharing remain same but least satisfied on using the device in person and set free from the fixed desktop to wireless laptop as couch comfort and now lately adds the mini tab making the social network friendly and entertainment. 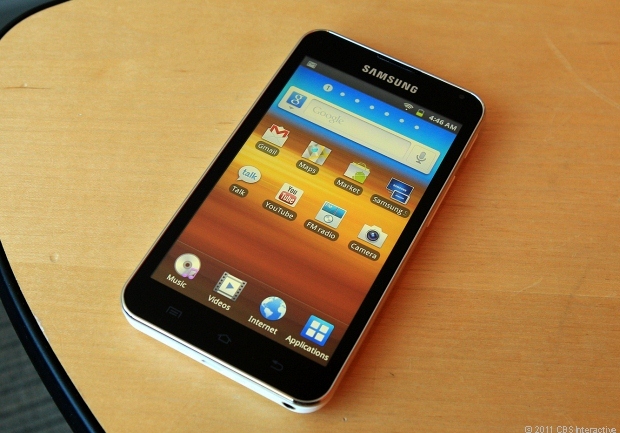 I was looking for a Smartphone lately but couldn’t get a decent one in least price and expectation, so bought a Samsung Galaxy Player 5.0, an android based handset which only lacks phone option of the Smartphone’s. The versatile handset has a brilliant 5” LCD screen for clear view on letters and large virtual keys for typing comfort... the player has a long standing battery to withstand as a quite eBook reader and player of music, HD videos and games. The intend for the smart player was the GPS enable and Navigation which I wish will help through my travel and connect with internet on hot spots. It has a better 3.2 MP Camera and camcorder with front VGA for video chatting and alert on email and message from time to time... there’s more to explore and use as mobile computer. 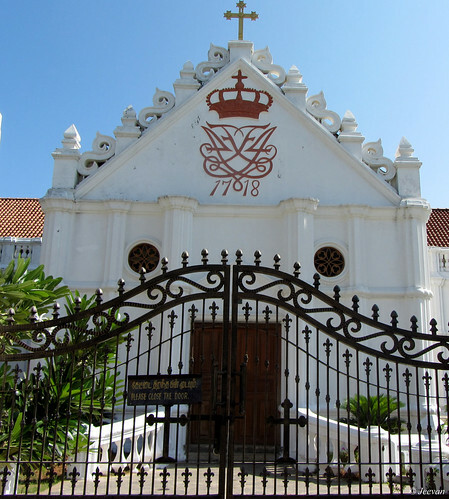 The New Jerusalem Church is one of a beautiful attraction of Tranquebar, built in the year of 1718 by Bartholomaeus Ziegenbalg, the first Protestant and Royal Missionary from Denmark to India. The church which was renovated lately to its original structure, without alteration, is yet to complete 300 years of built. The architecture of the church is an interesting synthesis of indigenous Indian features and traditional European church building style. 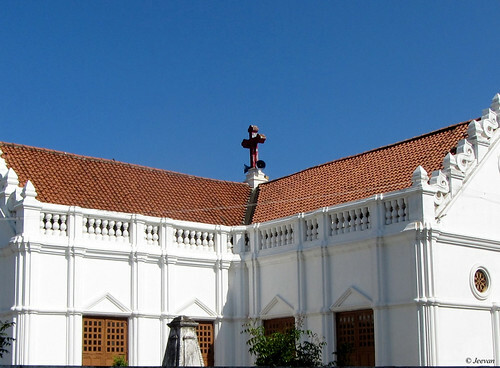 The church situated on the King’s Street is a pretty follow on Town Gate; and the white coated building with red tiled roof is an enthralling sight. The church built like a holy cross in shape, holds a small cemetery within its compound dating back to 18th century; and the Danish missionary and founder of the church Ziegenbalg is also buried in the churchyard. too much of anything isn’t gold. lack sunshine, and interest only grows on shadow. while many leads through burning struggle. 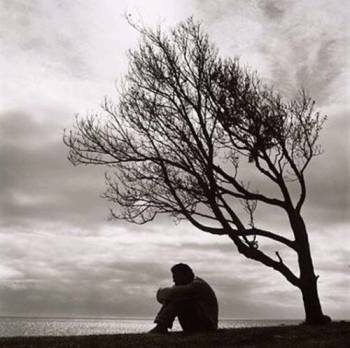 a humble gloom could please contrary noon. 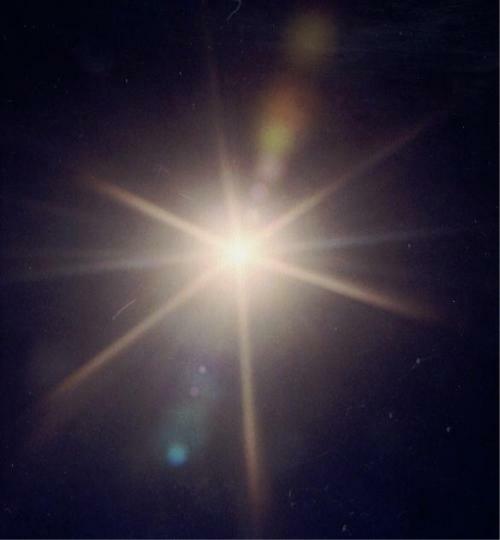 but for blinds darkness is a light leads eternal. During my childhood days, I used to wish visiting this Ganesha carved on the rock by a small mound in Mamallapuram – a town famous for rock cut sculptures and a UNESCO WHS near Chennai, while we visiting our relatives house there. 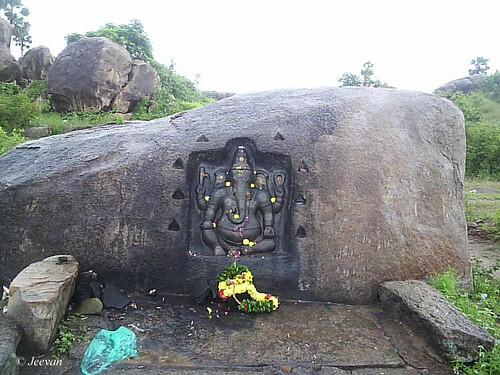 The rock cut Ganesha is very close to the Karukathamman Temple – one of our families commonly worshiped temples, in the west of the town; so, many of our visit to Mamallapuram witnessed worshiping at the temple and for me to check the Ganesha climbing on the rocks beside the temple. This photo was taken by mom in 2006, during one of our visit to Mamallapuram and today no one is allowed on this mound or checking the Ganesha, since archeology department has put fence across the area to protect. I really love visiting this temple, not in devotion but just for the isolation and pleasantness provide by the pond side with trees for shadow and benches to sit relax and cherish. Ganesh used to be my favorite god in childhood and my mom used to tell till date that my hands come closed wherever I see Ganesh then. Today the totally perception is different and I have come to believe there no god exists but I don’t deny the fact that I had great faith on god once, unconsciously. In no way I interrupt others belief on god and I respect their faith and wishes from heart for their plea get answered in some ways! I was watching this movie for sometime by parts until watched it quite last night; I totally impressed by the way it filmed even I find it initially boring as it moves slowly, the cinematography kept me appreciating and inspiring to watch it fully. Adapted from the novel title ‘The Invention of Hugo Cabret’ the movie is a 3D historical adventure drama winning a bunch of Oscars and directed by Martin Scorsese. I really wonder how fantastic would it be watching through big screen wearing 3D glasses. I hadn’t got the opportunity to watch it while it released last year. Asa Butterfield, who plays the title role of Hugo, was mesmerizing through his acting as a boy living on the clock tower of Paris railway station and maintaining it secretly while seeking to fit his father’s automation which he believes to write a message. During his continues process of stealing parts to mend the automation, results in discovering the concealed life of very famous illusionist and filmmaker Georges Melies and his way of moviemaking and all makes us upright and fascinate. The movie brings the whole set of old Paris railway station – Gare Montparnasse, alive and the clock tower and sight of Paris were amazing and the train crash was a great piece on the incident of past. Asa Butterfield eyes were grasping at lot than his conversation and motion, each one of them presents their course of acting very well and Ben Kingsley as the masterful Georges Melies is not challenging for the actor who lived as a Gandhi on the film titled the same. The film also reveals the innovation in creating special effects on movies when there are no more advanced technology and birth of computers.... the manual techniques of those days are awesome and challenging. 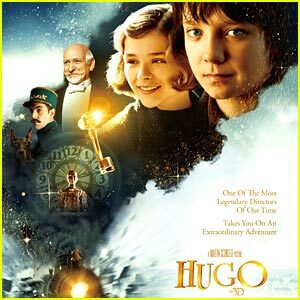 The Hugo somehow reminds me the polar express and technically the movie beholds wonder with great visual treat and sounds to listen! 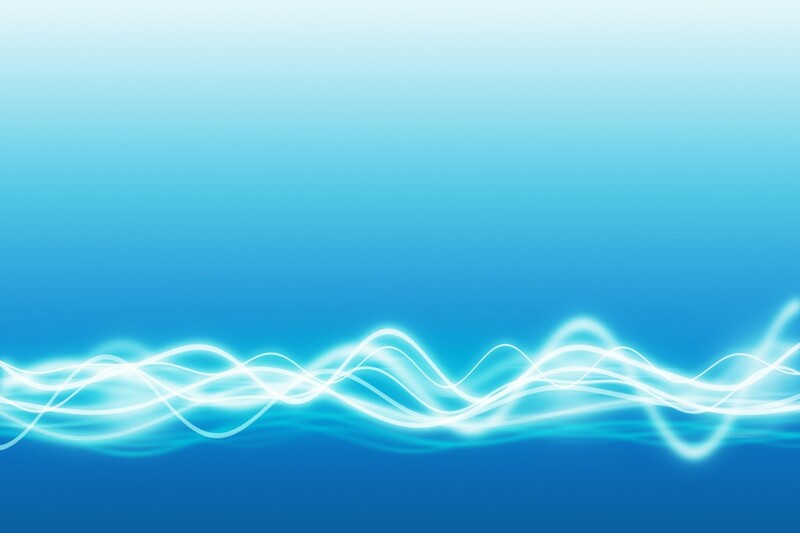 Hugo is one of a best innovation and use of technology. with no light moment to pass. in battle with constant grief. 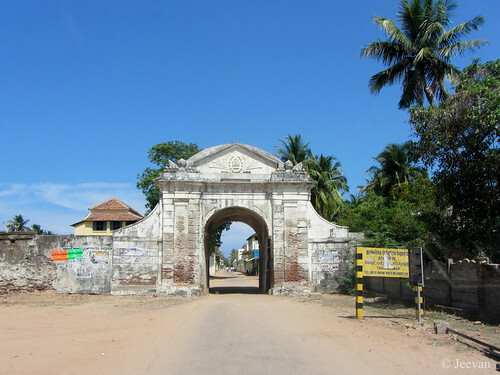 It was noon when we reached Tranquebar –an Old Danish colony, in the Nagapattinam district of South Indian state Tamil Nadu on an early summer month of March. Today know as Tharangambadi which means ‘land of the singing waves’ host some fascinating sights on colonial building, Danish fort and church and pretty beach of Coromandel Coast. 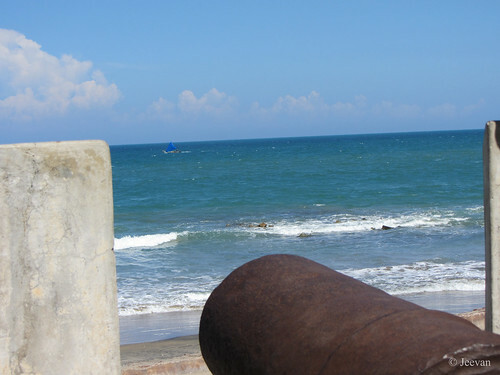 Tranquebar is a place on my waiting list for very long time and what attracted me to this town was the Fort Dansborg, built along the beautiful Coromandel Coast in the year of 1620 A.D by the Danish Royal Navy Commander Ove Gedde. 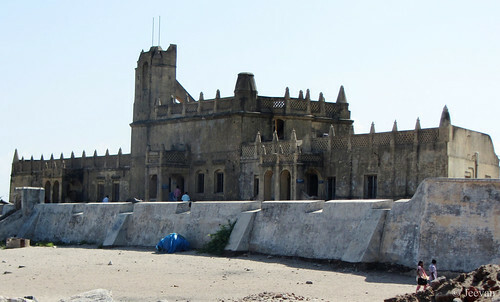 Tanquebar was once a flourishing trade center which continued to remain up to 19th century under the control of the British; and from the year 1977 the Danish Fort was protected as a monument by the Tamil Nadu State Department of Archaeology. We were invited into this town thought a picturesque arch gateway and one of the landmarks of Tranquebar, holding a caption of ‘ANNO 1792’ from the inside out marks the year it built. The gateway is flourished one side by the images of a lookalike king holding swords and separate swords on top end, with a dome bearing No.7. 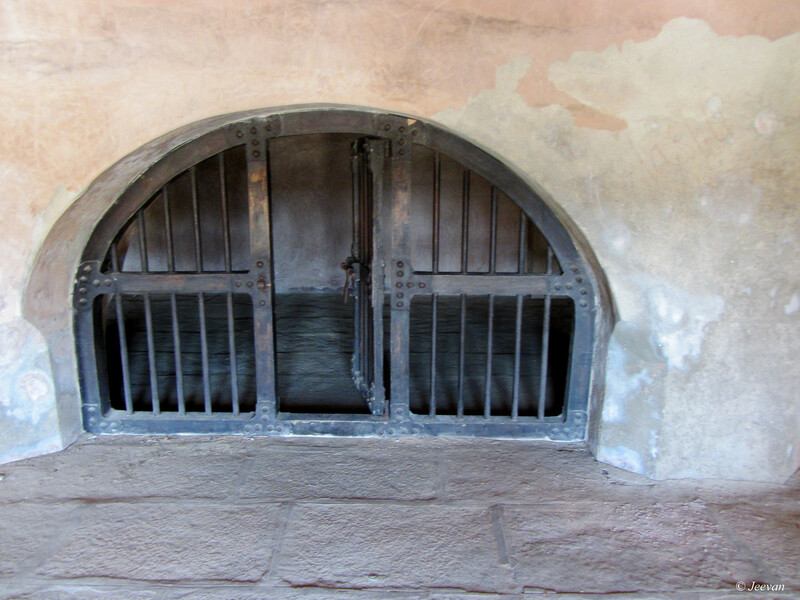 The gateway leads to the main street of the colony is very small to allow vehicles only comes under LMV (Light Motor Vehicle); and both sides of the street hold pillared buildings, a colonial style of construction. 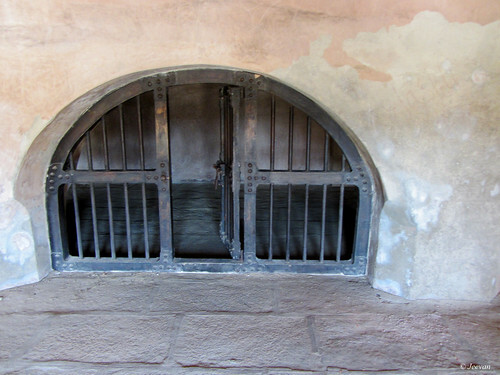 The Fort Dansborg is on the southeast end of the colony and the fort is a square complex with rampart walls on four sides, which has inner side rooms used as warehouse, prison, kitchen and barracks. 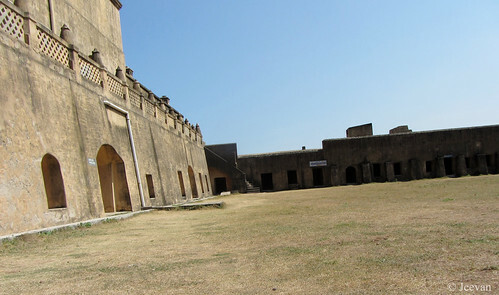 The fort has a two storied building facing the sea, which is also the main building of the fort, holds warehouse and prison to the ground floor has a vaulted roof. The first storey of the building which was once a church and lodging of the governor, senior merchants and chaplain, was now a museum exhibiting antique things collected from the period of colonial and Danish settlement in Tranquebar. 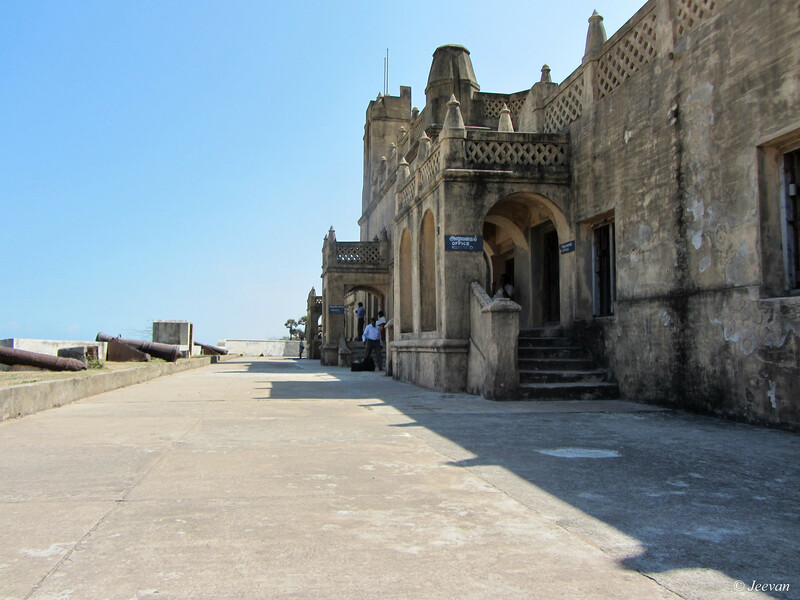 We reached the first storey of the fort through a ramp and fascinated to see the pretty blue sky and sea creating vibrant waves! The courtyard or rampart in front of the sea facing fort building has a wonderful view on the vast blue sea and sailing boats; which is also a platform to reach fort museum, and holds two iron cannons focusing on sea. Due to steps I couldn’t check the museum, but got few pictures captured by cousins and meanwhile I enjoy checking the exterior of the fort and children playing on its shore and wandering about. 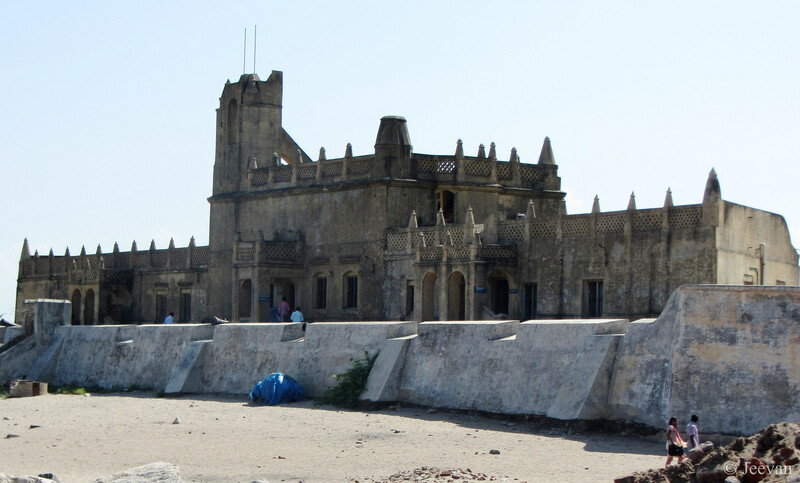 There are more to share on the Tranquebar, Fort, Museum ect... So I will do it on further posts. This weekend I watched another movie based on journey and unlike Duma, it’s a family drama; The Middle of the World is a 2003 Brazilian movie – originally titled ‘O Caminho das Nuvens’, takes a family of seven on a bicycle journey from the State of Paraiba to Rio de Janeiro of Brazil to lead a decent earning in city. The film is based on a real event in the history of an unemployed truck driver who rode his wife and five children from Santa Rita to Rio in search of a job. 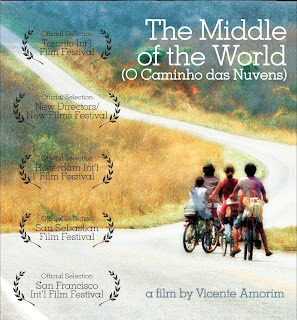 The movie begins at a T junction, where the sign reads in Portuguese meaning The Middle of the World, travels along the way from northwestern province to east for Rio, the nearly 2000 miles journey leaves the family at many hardship, event and emotional bond and desperate. The family also faces challenges over seeking on shelter, hunger, deals on adolescent; the movie make us believe that poverty is not that tough when we have great love for each other with faith. The movie leads a path not many traveled and there are no more usual things about Brazil – pretty beaches, girls, greenery... but a beautiful life and love for family relationship drawing against the dry northeast province. The ‘Rose’ and ‘Romao’ as husband and wife led so beautiful the movie, the young Rose was expressive, smiley, charming and singing despite fatigue over traveling. Antonia as their teenage son, was faithful to his character and expressions at defiant and desire for exploring the manhood. The movie end at the foot of Christ the Redeemer, the iconic statue of Rio de Janeiro leaves not alone a breathtaking view, but expresses life at redeem that not only befit to an incredible cycle journey. The locations that captured are not so enchanting but lives up to behalf and believed to be real; the movie runs for 80 minutes is a good watch under the eng subtitle that release along. The white-throated Kingfisher is a regular visitor to the Gulmohar tree on the open ground opposite to our house and the branches extends into our compound. 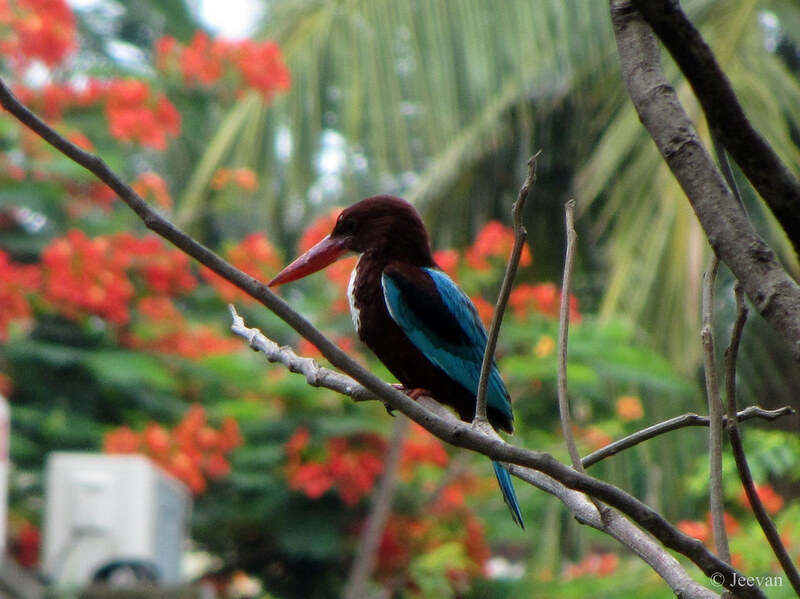 This is the first time for me to capture the one of the most beautiful birds, very closely and clearly! Last year I come across the heart of Chennai – the Mount road or Anna Salai, after long time and I got to capture few shots on the buildings that exist as one of landmarks and heritages of Chennai. We took a drive on Sunday which is the best time to take this stretch that’s almost busy throughout the week since it’s an arterial road and even it was little crowded that day, we managed to capture few photos on the buildings from the movie car, that follows below. LIC Building doesn’t need an introduction in Tamil Nadu as well throughout the country, but for others information, LIC (Life Insurance Corporation) is the Chennai’s first skyscraper and tallest building in India, when it was inaugurated in 1959. 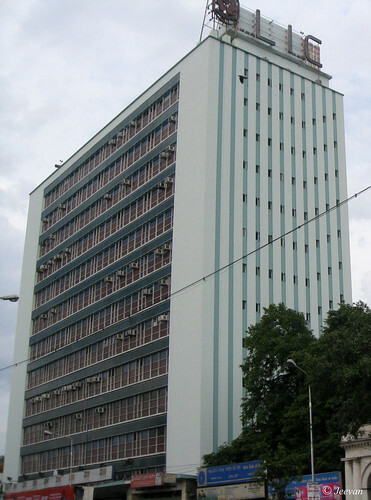 The 14 story building serves as the southern regional headquarters of the LIC India and the building marked the transition from lime and brick construction to concrete columns in the region. The building was designed by the London- based architects on the lines of the UN Secretariat in New York City; but the withdrew of architects from the construction after 4 years of its commence was overseen by Chennai based architect L.M. Chitale. The location on the Mount Road to construct the building was identified by Chidambaram Chettiyar, the founder of Indian Overseas Bank and the United India of Insurance, for his group’s headquarters. 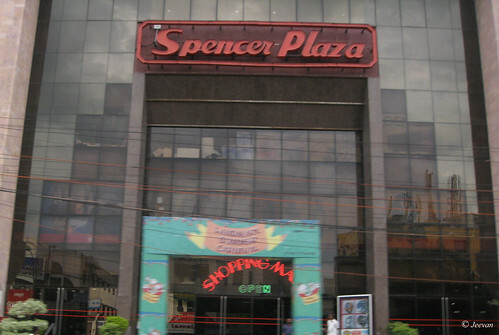 Spencer Plaza is the oldest shopping mall in India and a renowned landmark of modern Chennai (Madras). Originally built during the period of British Raj in-between1863-64, the Spencer Plaza is the first Departmental store in the Indian subcontinent, comprising India, Pakistan, Bangladesh and Sri Lanka. 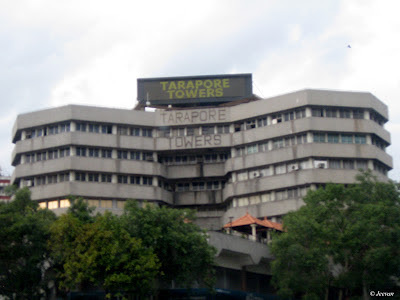 The building established by Charles Durant and J. W. Spencer was one of the biggest shopping malls in South Asia when it was built and the original building that destroyed in fire in year 1985 was an example of Indo-Saracenic style of architecture. The present Spencer Plaza was opened in 1991 on the same site, measuring about 10 acres and spread across a million square feet built in three phases with parking space for 800 cars. 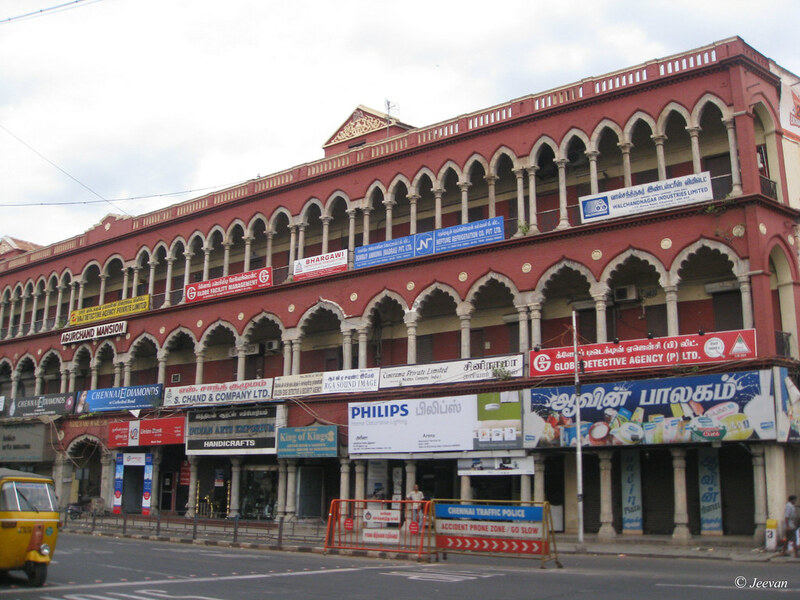 The plaza is one of the major hangouts for the Chennaities. Agurchand Mansion is a red brick stone building that date back uncertainly more than a century; and it is near opposite to the famous Spenser Plaza. The building is built by an old Madras family called Agurchands; and today the building holds quite commercial shops on the ground floor, whose number of hoardings occupies much space of the building facade, but there are no details about the Mansion, whether it’s running or not. Tarapori tower’s is half a km from LIC building and the large sign hosted on its terrace was one of the attractions on Mount Road. This is the first public LED display come up in Chennai, over 25 years ago or certainly longest time in survive and it usually displays time and temperature of the city. I watched this 2005 adventure drama, Duma, which is a movie based on the friendship between a boy and cheetah and it is a true story loosely adapted from the book titled ‘How it was with Dooms’. The story set in the South Africa, takes us thought a wonderful journey across the dry grasslands, deserts and wildlife... filled with various adventures and revealing the beautiful relationship between a boy and cheetah. Alexander plays the role of a fearless schoolboy, adopting cheetah as his pet and venture into the wild as per his father’s decision to leave the cheetah back at its real home. The movie wasn’t distinctive among the wildlife adventures and its dealings are very simple and lighthearted to quick pass with strong emotion shared by the boy and cheetah. The desert sailboat rides on the converted bike and cheetah chased beside the speeding bike are few exciting moments and the background score was so fascinating through the 5.1 channel. What more enthusiastic was the cinematography, which is a real visual treat with scenes changing on landscape and wildlife are notable. The movie directed by Carroll Ballard and produced by Warner Bros also stresses the comfort at home and for the wild animal’s forest is the only place to alive and it’s impossible to exchange its base. 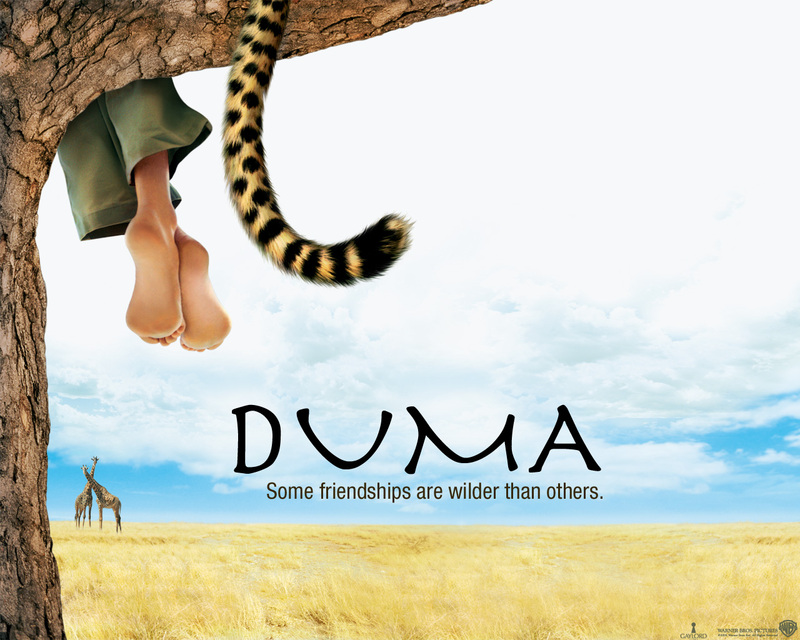 Duma is the name of the cheetah and since the story adapts fiction its enjoyable quite unquestioning the impossibilities.